I mentioned in my previous post that I’d screwed up the finish on the top for the Thorsen Table. Getting the finish on evenly, without dark puddles there the breadboard ends met the top and without streaks was a challenge. I probably should have diluted the Shellac a bit more. But in the end, I got a decent buildup without any real issues. The problem was when I started rubbing it with steel wool I went through the shellac in a couple of places, and the color difference was very obvious. I tried toughing it up and things went downhill from there. In the end I poured alcohol over the whole thing and scrubbed it with steel wool and dried it with rags. I repeated this until I was sure I’d gotten all of the shellac off, and pulled enough of the Linseed Oil base coat off that I could re-dye it. The stripping process lightened the dye job, which was also too light to begin with. The table base was a bit darker, so I re-applied the dye and let it site a good 5 minutes to make sure I got good penetration. I scrubbed it with 0000 steel wool while the dye was soaking in to help things along. Then I let it dry overnight, and applied a fresh coat of Linseed Oil. I let the piece soak up oil for an hour before wiping it off and taking this picture. The top has been drying for several days now, and I’ll apply shellac again tomorrow. I know I said I didn’t want to introduce another variable, but after mulling it over I’ve decided that I’ll try spraying the shellac this time. I’ll to a sample piece first to make sure I have a workable dilution to get coverage and flow out. I’ve painted cars, so I’m not overly concerned with this step (famous last words there!). I might scuff sand the base and shelf and shoot them with a very thin final coat too. 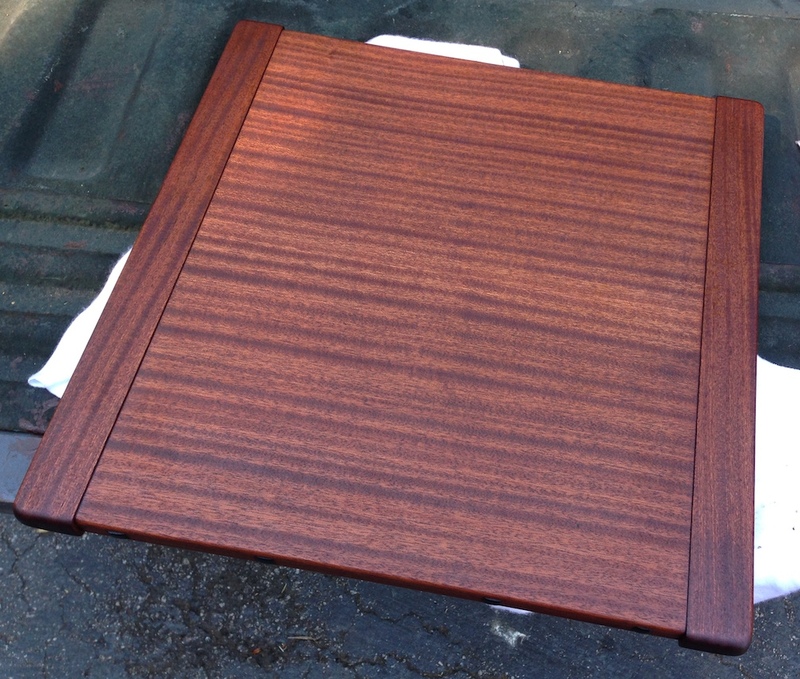 For comparison, this is the top (with ~3 coats of Garnet Shellac) before I ruined it with steel wool. It’s not a bad color, but it needed to be a little darker I think. 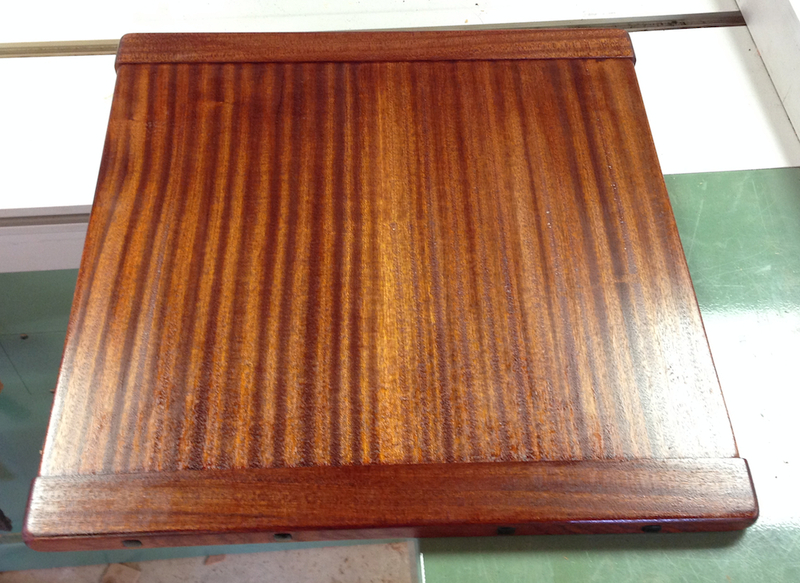 Top with 2-3 coats of shellac — I accidentally rubbed through the shellac and stripped it after this was taken. Sorry to hear about the setback and subsequent rework. On the up side, I really like the way the top is coming out on this second time around. It looked good before but now seams to be a bit richer in tone. All of the extra effort is really going to pay off. Thanks, it was frustrating at the time but I think it’s going to look better in the end as a result. I had to do some digging, but I found a picture of the last thing I painted with my spray gun. I did the metalwork, orange metal flake paint over a black base coat and the clear topcoat. My friend “real ralph” did the artwork — with a brush (not airbrush) — mimicking a 60’s Fillmore concert poster that I’ve always loved.